This 3 building Villa Estate is renowned for its luxury, both in design and function. Situated on 36 acres of primary rainforest and located at the end of the road surrounded by over 200 acres of preserve, the privacy this compound provides is unsurpassed. The Main Villa rules over the estate with the class of an exotic country club. You are greeted by the vaulted mosaic barrel ceiling of the entryway, which leads you to the great room with its vaulted teak wood beam ceiling with chandelier. On the ground floor sits a sunken lounge area with handcrafted wooden bar, quiet reading nook, as well as indoor and outdoor dining areas. The professional kitchen is fully equipped with all appliances, granite counter tops and dehumidified pantry. A covered BBQ grill area is connected to the outdoor dining area. The second floor holds two rooms, currently used as a spa room and office, as well as a yoga pavilion and ocean view area. Extending out the sliding glass patio doors sits the mosaic tiled patio with loungers and sitting area, this is the optimal area to enjoy the sunset views. The 1,700 sq. ft. infinity pool finished with glistening imported blue glass tiles features shallow “beach” sections, a calming waterfall, a Jacuzzi and an outdoor shower. The ocean view framed by the surrounding rainforest, which extends off the infinity pool, will make your heart skip a beat. To the South of the Main Villa you discover the two Guest Villas. Each Villa has four bedrooms, two 700 sq ft junior suites on the ground level and two 1,400 sq ft master suites with balconies on the second level. The Ocean view Guest Villa rests at the front of the property overlooking the pool area, with views of the ocean sunsets and rainforest views from all rooms, it is easily accessed from the Main Villa. The jungle view Guest Villa rests back from the Main Villa, privately surrounded by the manicured gardens and primary rainforest. All rooms are equipped with air conditioning and ceiling fans, finished with porcelain tile, stone sinks, glass tiled showers and tropical detailing. The surrounding property features 4 miles of hiking trails and 3 private waterfalls, including one with a 30 foot drop. There is ample land for further building of additional small villas or jungalows. 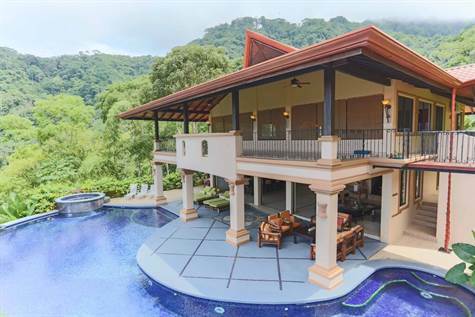 With a successful vacation rental history over the last 4 years this Villa Estate has been the top choice in the Dominical area for TV production crews, yoga retreats, weddings and family vacations. This Villa Estate offers leisure and privacy at its finest, to be used as a luxury vacation rental or as a privileged hideaway.